JMeter is one of the most popular, open source performance testing tools among the software testing professionals around the world. 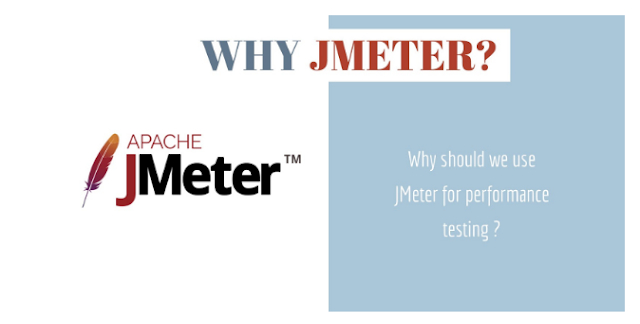 There are number of reasons for JMeter to be popular. We shall share some of the reasons in this post. Test scripting is not essential to build performance testing test plans. Test plans can be built by adding and configuring available components in JMeter IDE. This allows beginners to create effective performance test plans without any scripting. Learning or mastering a tool is not sufficient for a successful performance testing projects. Good understanding of the context, test planning, test design, test execution and test reporting is essential for a successful performance testing project. JMeter do support the scripting. Advance users can use the scripting (example Java, Groovy, BeanShell scripting) to extend the ability of JMeter. JMeter is an Apache project. The source is available to the community. JMeter source code can be modified and built for specific needs if required. JMeter is developed using Java. Java applications can run on any platforms. Hence JMeter can be used on Windows, Mac , Linux or any other operating system when compatible JVM is available. There is a huge community around the tool. There are active user groups in LinkedIN, Facebook , StackOverflow etc. Questions are answered within acceptable time period. The users can rely on the community for support questions. There are organizations who provides commercial support too. Reporting is one of the poor feature available in open source tools as compared to the commercial tools. Fortunately JMeter supports various reporting formats through available listeners and plugins. Also the test results can be upload to external reporting tools and generate commercial grade elegant reports. There are number of listeners available out of the box for saving the test results. Test results can be loaded into the listeners to view the test results later too. The test results can be loaded into third party tools (example blazemeter ) and generate the test reports. There are number of plugins available for reporting. User concurrency ,number of virtual users can be simulated using thread groups. Jmeter supports not only the web applications. It supports wide range of applications, protocols and servers. Here is the list extracted from the official site. Test plans creation can be started with recording feature available with JMeter. Also BabBoy software can be used for exporting the recorded flows into JMeter test plans. Some commercial tools based on Jmeter can be used for creating the JMeter scripts easily. Fore example Blazemeter’s Chrome plugin. JMeter can be used for recording the requests sent from the device to the servers through its proxy configuration. Hence JMeter can be used to record the requests from mobile applications and web applications running on Android and iOS devices. JMeter has comprehensive documentation available online. It covers from installation, configuration, creating basic test plans , components reference, best practices , extending JMeter and much more. Component references, function references etc can be accessed readily from context menu, shortcuts or menu. A copy of user manual and api documentation is shipped with the installation and available for offline access. JMeter GUI is very user friendly. Components can be added by just right clicking a node in the test plan. Components can be configured easily by filling the placeholders (input boxes ). GUI can be customized further for user need by configuring the properties ( in bin/JMeter.properties file). For example toolbar display, look and feel, proffered GUI language can be customized by updating the respective properties in the property file. There are good collection of free online documentation , blogs , Q&As and videos available. There are paid online and public training programs available around the world. JMeter capabilities can be extended through pluggable components (samplers , timers , listeners etc). Free custom JMeter plugins can be accessed from https://jmeter-plugins.org/. The plugins can be managed (install, uninstall) easily through the plugin manager interface. User has access for commercial plugins covering custom features. For example UBIK Load Pack Plugins. https://ubikloadpack.com/. UBIK also do custom JMeter plugin development on demand too. I really enjoyed ur tutorial. Please share selenium automation tutorial using python in YouTube . Now every company preferred python. Really a very helpful Article. Thank You.